Last week, I was a guest on Charles Payne’s Making Money show on Fox Business News. I’m a big fan of Charles’ show and was elated to be asked to appear. We filmed two segments on the Fox Business set. The TV chyron showed that the market was having a rough day, as the Dow Jones Industrial Average was quoted down over 500 points. Afterward, the producer told me that is Charles’ preferred temperature. I guess it’s the appropriate climate to keep the guests alert. After about five minutes, you don’t realize it’s cold anymore. I was thinking that was an interesting way to describe the current market “adjustment.” It’s like the cold that you think is chilly, but after a few minutes, it feels totally fine. Markets are adjusting to the end of TINA — the narrative that “there is no alternative” to stocks. This was a decade of low (mostly zero!) interest rates when stocks were the only game in town. With interest rates held at zero for eight years, there simply was no fixed-income alternative to the stock market. This was the catalyst that drove investors, particularly institutions, into stocks. You just couldn’t find a decent return on cash or fixed income. So you had to take more risk. However, things have now changed. In the past two years, the Federal Reserve has steadily increased interest rates from 0% to 2.25%. And they’re likely to move another quarter point at the December meeting. Well, labor markets are tight. Unemployment, at 3.7%, is at multidecade lows. When there is a shortage in available labor, employers start paying more to acquire new hires. This makes wages go up, which, in turn, makes prices go up. And that leads to inflation. Or at least that’s the idea. Not every economist agrees on this. There is also economic research that suggests wage increases don’t always lead to consumer and producer price increases. The point is, none of this is an exact science. Humans are not rational beings whose behavior can be explained by economic models. That’s why I’ve always paid more attention to what the markets tell me than what economists believe to be true. The only certainty with markets is that there is no certainty. What I’m getting to is that the markets told us that a tipping point happened in September. Suddenly (albeit you could have seen this coming from a few miles away) the rate the Fed pays banks on cash (2.25%) surpassed the rate of inflation (2%). And this was the end of TINA. For investors, that means you can hold cash in a money market account (you can check rates here) and beat the current rate of inflation. That means your cash won’t lose purchasing power. For the first time in 10 years, holding cash at money market rates became an attractive alternative to stocks. This surprise felt like walking into a chilly room, as investors reacted by selling stocks. And the selling brought down prices, which brought out more sellers, which brought down prices even more. From my perch, it looks like the markets have already priced in the Fed’s work, at least in the short term. Most importantly, the five-year breakeven inflation rate at 1.73% is at its lowest level of 2018. This is calculated by taking the difference between the five-year Treasury constant maturity rate and the yield on an inflation-protected security with five years remaining to maturity. 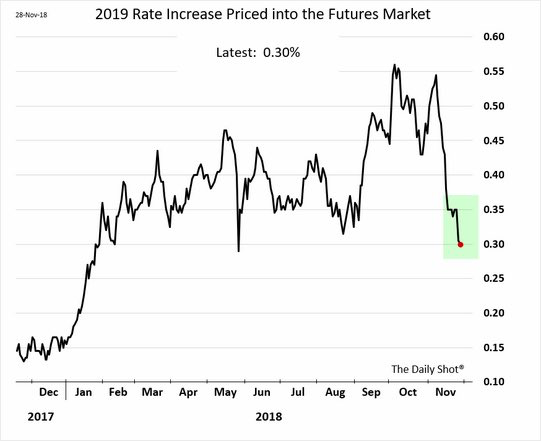 This tells me that the market’s inflation expectations for the next five years is at their lowest point in the past year. The Fed has successfully broken inflation in the minds of investors. This tells me that the market is now expecting Fed Chairman Jerome Powell to pause at some point next year. The Fed might not have killed inflation, but at least it killed investors’ expectations of inflation. And that’s a good thing. The Fed’s work here is done, for now. Next »Are You a Tax Reform Winner?